Your teeth play an important role in biting and chewing food for proper digestion, giving your body the nutrients it needs to survive! It’s easy to take our teeth and the hard work they do for granted. Without properly cleaning them, bacteria and leftover debris can fester in your mouth—often leading to tooth decay. If you want to show a full set of teeth for as long as possible, you’ll want to provide them with the proper care—at home and in the dentist’s office—so they can look and work their best! While skipping your daily brushing routine once in a great while isn’t a huge deal, making it a habit can have real consequences. Brushing your teeth twice a day and flossing once a day is recommended to wash away harmful bacteria and plaque hiding in your mouth. Left for too long, plaque can harden into tartar (calculus) and be much more difficult to remove—requiring a more extensive visit to your dentist, and often leading to tooth decay. This is why routine professional cleanings are so important! A professional teeth cleaning by your dentist/hygienist is recommended at least twice per year to remove harmful plaque and tartar build-up on your teeth. Besides a cleaning, your dentist/hygienist can also polish your teeth to remove any stains and brighten your smile! During a professional cleaning, your dentist in Newnan will be able to detect any early signs of decay, and can form a treatment plan to treat and prevent any further damage. Cavities (tooth decay) occur when there has been permanent damage to the surface of the tooth. Cavities can start out very small, but can continue to affect the deeper layers of tooth structure, if not properly treated. In severe cases, neglect can even lead to tooth infection and/or loss, so it’s important to address any signs/symptoms of decay as soon as we can. Symptoms of a cavity might include a toothache or tooth sensitivity, sharp pain when eating or biting down, or staining on the surface of the tooth; however, shallow cavities may present without symptoms at all. In these cases, you might not be able to detect when a cavity is forming—which is why routine professional cleanings and check-ups are so important! 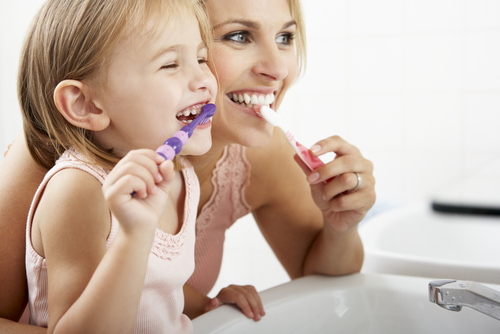 If you experience any signs of tooth decay, or think it’s time for your routine professional cleaning, contact Schultz Family Dental for an appointment, and get your teeth looking and feeling their best!